The only image of the game released before the game was revealed to be a hoax. Croc 3: Stone of the Gobbos is a hoaxed, non-existent video game sequel to Argonaut Software's Croc series alleged to be in development from 2001 to 2005 when Argonaut was dissolved and the rights to the series was given to Zenimax, instead of Jez San who still has the rights to the series to this day. Argonaut Software was set to release the final installment of the series, Croc 3: Stone of the Gobbos which was going to be released onto PS1, PS2, GameCube and Xbox and directly continue where Croc 2 left off; Croc would be facing Baron Dante and saving the Gobbos again, but this time Dante has a spell that Croc can only stop with the sacred "Stone of the Gobbos" he has to find. The game was going to have "Full Explorable Hubs Worlds" to make it easier for younger players similar to Spyro: Year of the Dragon. Also notable was the fact that on the PS2, GameCube and Xbox it was going to be optionally two-player with the second player being a new character Ginger, a love interest for Croc. In addition, Justin Scharvona, was to return to compose the soundtrack for this game. The game originally started development in 2001. Argonaut had split into three teams, and one of them was for making this game, which was composed of a total of only ten people, so the game went through many changes. Like how Croc’s original voice actor didn’t want to return to the role, so they had to recast, and the engine they were working on was an unstable version of their in-house engine BRender, which also powered Malice and a couple of other Argonaut games, but this version, in particular, was a new and exclusive updated version that allowed for certain things that tried to push the four consoles to their limits. It was also first in development for Dreamcast, PS1, PS2, GameCube, Xbox, and PC, but then stripped down to just the PS1, PS2, GameCube, and Xbox. The PS1 version, in particular, took more time to make as they were using a previous version of BRender that the original games used, as the newer version of BRender couldn’t work on the PS1 due to its next-gen graphics. As mentioned before, the newer console versions would have top of the line graphics developed in-house to push the consoles to their limits, and the PS1 version’s graphics would be the same as Croc 2, and they insisted on having Croc 3 released on PS1 to keep the trilogy in line with each other on the PS1 as, again, the series was always planned as a trilogy. At one point it was planned to be released in 2005 but possibly only onto the PS2, GameCube and Xbox. However, Argonaut closed in 2004 which led to the Croc IP being sold to Zenimax Media Inc, who would have had Mad Duck Productions continue development on the game, but the game was cancelled after trouble with the developer. The preceding information of Croc 3 was then released to Unseen64 by former Argonaut employees who were from the team that worked on Croc 3. A very early playable prototype of the PS2 version was going to be leaked by a former Argonaut employee (who released info about the game to Unseen64) at some point but the founder of Argonaut rejected it, as the employee was actually only allowed to release the info about the game and nothing more because Zenimax is apparently a "Cease And Desist crazy type company". It was later confirmed on Unseen64 that the information provided regarding the alleged cancelled Croc 3 was fake as numerous instances such as the claim that the game was cancelled due to Zenimax Media Inc. owning the Croc IP. 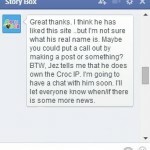 This was later proven to be false when developer, "Story Box" revealed that they had been in contact with Jez San (co-producer of the original games), who claimed that he still owned the Croc IP as the developers had intended to include Croc in an upcoming title. 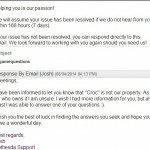 An Unseen64 user, OldClassicGamer, later revealed that he had contacted Bethesda Works, a subsidiary of Zenimax Media. In that email it was confirmed that Zenimax did not own the Croc IP, disproving the claim made that a build for the game would've been leaked if it wasn't for Zenimax (in the developer's statement), being a "strong cease and desist type of company". Facebook message with the developer "StoryBox"
Email with the developer "Bethesda Works", a subsidiary of "Zenimax Media Inc."
↑ Unseen 64 article on Croc 3. Last retrieved 24 Jun 2017.